Olympian High’s Gil Warren is considered a genius in the South County football community.His most astute move may have been in 1969 when he invited an aspiring young defensive coach out of San Diego State named Reldon "Bing" Dawson to join his staff. 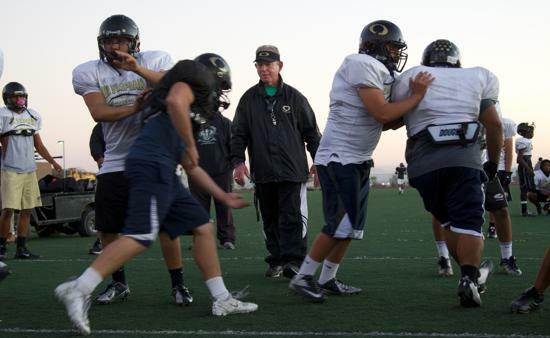 CHULA VISTA  Olympian High’s Gil Warren is considered a genius in the South County football community. His most astute move may have been in 1969 when he invited an aspiring young defensive coach out of San Diego State named Reldon “Bing” Dawson to join his staff at Castle Park – and, for a while, even more. While they no longer share any living arrangements, they continue to share success. Olympian just concluded a 10-0 regular season, earning its second-straight Mesa League title and the top seed in the Division III playoffs. Dawson’s defense held opponents to under two touchdowns a game and 12 points under their season’s average. After graduating from SDSU in 1967, where he played linebacker/fullback, Dawson had the good fortune to hook on as graduate assistant for the Aztecs. He witnessed firsthand the coaching skills of Don Coryell, John Madden and Claude Gilbert. Dawson’s first stint at Castle Park lasted from 1969-1983, including two years as head coach, a job not for him. “It seems you do nothing but handle problems and not get to coach,” he said. He moved on to a highly successful stint at Southwestern College, again with Warren. In 1991 the duo returned to Castle Park. From 1993-96, the Trojans earned three trips to the CIF finals, including championships in 1994 and 1996. A trait of Dawson’s defense is conditioning, both physically and mentally. In a 2004 Union-Tribune article, then Chargers linebacker Zeke Moreno, who had been a standout at Castle Park, revealed he appreciated Dawson’s value when he first attended USC in 1997. Dawson’s tireless work ethic doesn’t stop on the gridiron. It’s in his blood. Another passion since his college days is rugby. What started as a group of hell-raising, beer-guzzling ex-football players migrated into the Old Mission Bay Athletic Club (OMBAC) Rugby Team. In 1967 a mass was removed from behind his lung, ending his playing days. It opened up a new avenue for him – coaching rugby. Dawson led OMBAC teams to more than 500 victories and numerous National Club Championships. He also coached for Southern California, the Pacific Coast Grizzlies and the U.S. Eagles National Teams. In 2007 he again hooked up with Warren, joining Olympian in its first year of varsity football and as a teacher of Advanced Placement history. After a slow start, the Olympian program took off. Over the last four years the Eagles have averaged 10 wins a season. Last year they made the Division III final at Qualcomm, falling to Cathedral Catholic. Dawson has no timetable to call it quits. “I would die the first year I retired,” he joked.